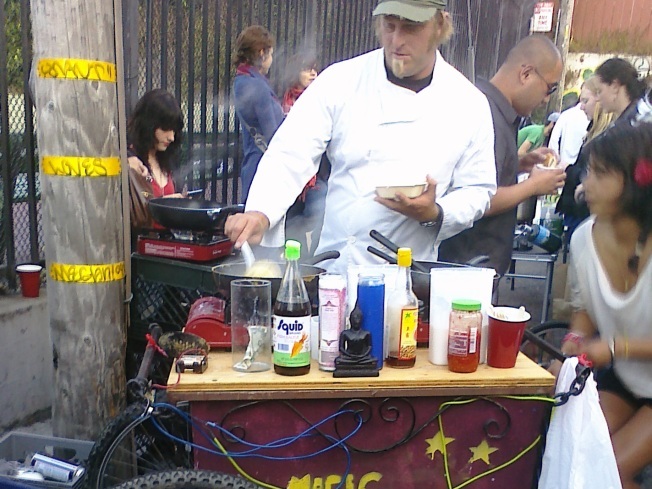 Brian Kimball has gone from making some spare money to considering making a living from his portable curry cart. For five bucks, you can get a bowl of rice, chicken and seasonal vegetables slathered in Thai curry sauce from the Magic Curry Kart. Proprietor Brian Kimball started the project looking to earn a little extra cash, while moonlighting from his day job as a therapist for children in the Tenderloin. After a couple of early successes, he is now has one of the hottest carts in town and on Twitter -- even his brother has taken up the profession, going by the moniker Creme Brulée Guy. The business has been good enough to Kimball that he's been able to upgrade his cart to a bike-powered model in order to get to more events. It is, however, quite a bit of work, with plenty of shopping and prep and heavy hauling after work and on weekends. And success has him considering whether or not to ditch the day job. "I gotta jump in or out," he told Mission Local. Jackson West figures the more curry the merrier.